We received an invitation by William Chris Vineyards to attend a concert they were having starring Texas artist Larry Joe Taylor. 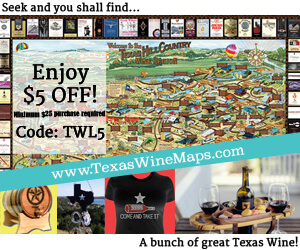 We gladly accepted and started planning a road trip to Wine Road 290 and the area for the weekend. 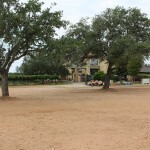 On the way to our planned first stop, we made a quick change when we realized it had been a little while since we had visited Texas Hills Vineyard so we made a slight detour. Unfortunately we arrived to the winery about one minute after a group of cars. 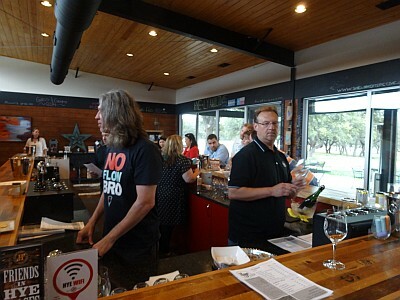 By the time we got into the tasting room, the entire half-circle tasting bar was full while co-owner Gary Gilstrap was making pasta for Wine Road 290’s Vino & Pasta event. Since we had an appointment we needed to make, we unfortunately had to leave. Next time! Next was a visit to Hye Market and Hye End Tasting Room. The store has grown quite a bit from the first time we visited and wine, beer, and spirit tastings are done every Saturday. From advertising for the Saturday, we learned Pontotoc Vineyard would be giving tastings. 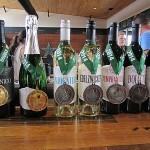 We were looking forward to seeing owner Carl Money again and taste his new wines. We talked to Chef Bruce who is now at Hye Market with sandwiches and other food available. Carl Money soon came and after setting up his tasting area, we tried all three wines he brought: Estate Tempranillo 2012, Smoothing Iron Mountain 2012, and San Fernando Academy 2012. When we left, we ended up buying all three including an Estate Tempranillo 2011. In the meantime, Mark Watson, owner of Compass Rose Cellars stopped in at Hye Market to say hello to everybody and told us about the winery he’s currently building a mile up the road from Hye. Compass Rose’s winery production is currently located in Mason and this will be a second location for the moment. He offered to drive us up to the location and give us a tour. So we hopped into his truck and made the short ride to the site. 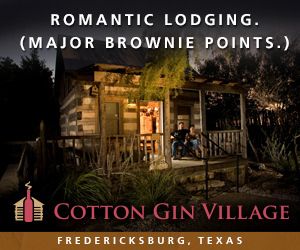 He explained where various things would be located including the tasting room at the top of the hill on the property. 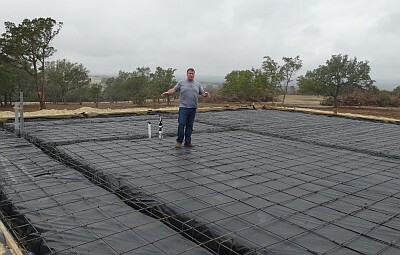 The foundation should be poured soon and he expects the building to be complete in less than two months. It will definitely be a great place to sit and enjoy a wine with the silence and beautiful view of the area. 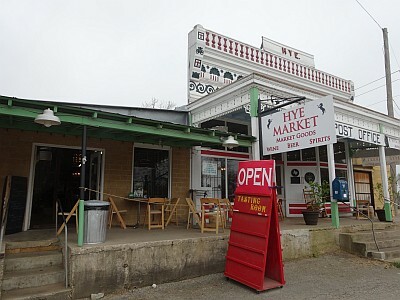 Our next stop was going to be Pedernales Cellars where we were to have lunch with President Fredrik Osterberg, so we picked up three sandwiches from Hye Market to go. Fredrik was waiting outside the winery for us when we arrived and since there had been some light rain on and off, he suggested we eat lunch in his office. 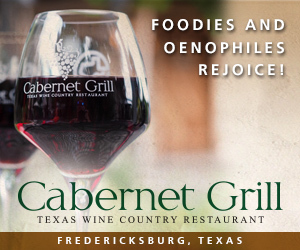 We all enjoyed the sandwiches while Fredrik talked about recent happenings such as Texas Fine Wine and new wines they had released including a five blend white wine called Cinco and a George Bush 25th Anniversary Reserve 2012 Tempranillo. He also told us of plans they have with the winery’s buildings which sound great, but I don’t want to spoil any announcements they will be making. When we are back in the area Memorial Day weekend, the plans should be complete and hopefully we will have the opportunity to enjoy them. We thanked Fredrik for his time and loaded up the car with more wine we purchased. Tip: Bring an empty wine case box on your trips to easily carry any wines you buy. 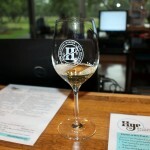 4.0 Cellars was next and I was hoping to taste some of Brennan Vineyards new wines. Winemaker Todd Webster told me Pat Brennan would be delivering some of the new wines to 4.0 Cellars that afternoon. Unfortunately, we were running a little late and we missed seeing Pat at the winery, but we heard he did bring the wines. 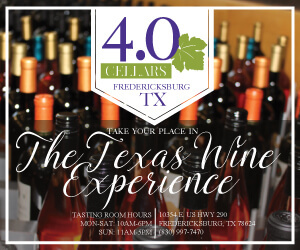 We did a regular tasting of 4.0 Cellar’s wines from McPherson Cellars, Lost Oak Winery, and Brennan Vineyards, and then had the opportunity to try the new wines from Brennan Vineyards. I was looking forward to trying the dry Rosé Malbec because Gloria doesn’t usually care for Rosés but loves Malbec. Sure enough, she has now found a Rosé she likes. The 4.0 Cellars Nero d’Avola was also excellent and will only get better in the bottle. The wines weren’t in the system yet for buying so we will have to stop again next time we’re in the area and hopefully they won’t be sold out of them. 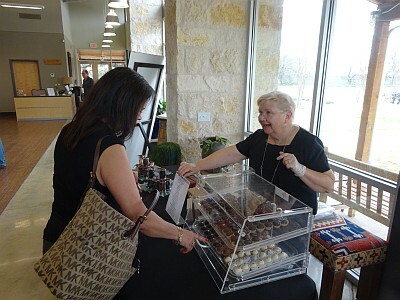 Also at 4.0 Cellars was the adorable Cathy Locke of Cathy’s Sweets and we came home with some of her chocolates. She told us of some exciting news for her and we wish her the best of luck. Heading back to Hye, we stopped in at Hilmy Cellars to try any new wines and see one of our favorite tasting guides, Vinny Lupo. Last year when we bought a bottle of each wine, they had recently been bottled. After some time in the bottle now, the wines are really tasting great. We also had the pleasure of seeing owner Erik Hilmy again. 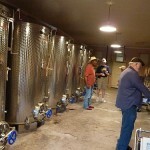 Last year we visited Hye Meadow Winery when it was still being built. I have been there since it was finished but Gloria had not, so we had to stop. Fortunately owner Mike Batek and winemaker Jeff Ivy were there and Jeff led us through a tasting of their newest wines. Gloria was impressed with the finished winery and it is always nice to see how something under construction turns out. 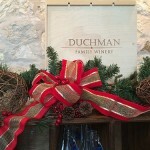 As was true with every winery we visited, at least one bottle was added to our wine case box. 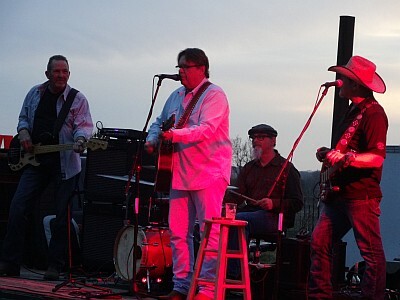 It was now time for the concert at William Chris Vineyards so we made the short trip across the street. After buying a bottle of wine, the Blanc du Bois, to enjoy during the concert, we visited the two food trucks present. We both chose the barbecue food truck and found a spot at a table to eat and listen to the concert. Another couple joined our table and we struck up a nice conversation with them. 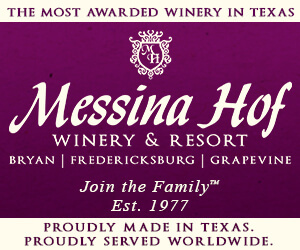 Since they were fairly new to the Texas wine scene, we were happy to answer any questions they had. 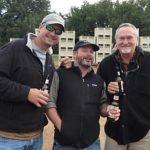 They had not tried the Blanc du Bois so we shared some with them and they shared the newest 2012 Hunter with us. The sun was setting and the crowd was settling in with anticipation for Larry Joe Taylor to take the stage. The concert started and from the sound of the applause after each song, the crowd was really enjoying the concert and their time at William Chris Vineyards. During the concert we had the opportunity to speak with co-owner Bill Blackmon. Check out Larry Joe Taylor if you get the chance to see him in concert, and thank you to William Chris Vineyards for the invitation. Brock Estes, owner of Fly Gap Winery, was having a release party of his newest Dank wine called “Lights Out” at Sandstone Cellars in Mason. We decided to catch the end of the party and headed to Mason. 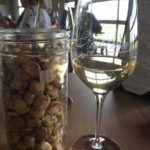 After checking into the nice Bickenbach Guest Haus, we went to the Sandstone Cellars Wine Bar where the release party was being held. 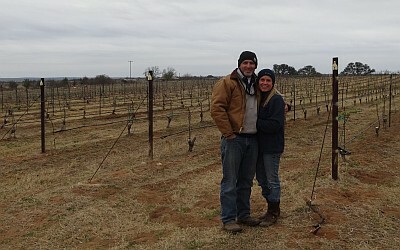 We caught up with Brock Estes and his wife Melissa, and our glasses were soon filled with his new wine. 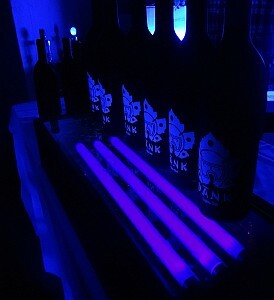 He then led us next door where he had a nice setup with a black light and the wine bottles sitting above so the wine bottle label would be illuminated by the black light. 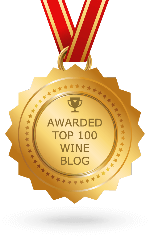 It was definitely a very nice showing for Fly Gap Winery’s new Dank wine. We then ran into Dan McLaughlin from Robert Clay Vineyards. We had planned on helping them prune Sunday morning but it was uncertain if the weather would cooperate. He introduced us to Jess, the writer from Chick in a Van, who has been helping the McLaughlins recently. She has been traveling around the country and staying in her van, so she showed us the van’s conversion which was pretty nice. 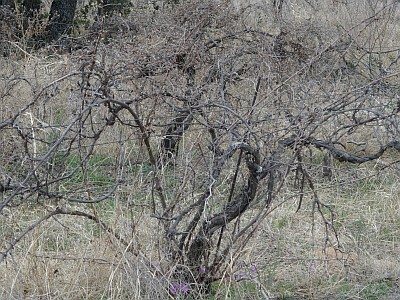 We arranged to meet at the vineyard at 9 a.m. in the morning to do the pruning. Sunday came and it was cold! A couple of texts later and we would still meet them at the vineyard at 9 a.m. but we would just take a tour. 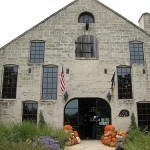 We arrived at Robert Clay Vineyards and Dan and Jeanie McLaughlin along with Jess were there. We walked through the rows of vines with Dan explaining all the work they had done from the beginning of working the vineyard and then the previous day when they pruned the Chardonnay. There are 15 acres of vineyard with Chardonnay, Merlot, Touriga Nacional, and an experimental vineyard where different varieties are tried. The vineyard is laid out with the Chardonnay at the top of a hill and going down the hill is the Merlot and Touriga Nacional. As we reached the bottom of the hill, it was very obvious it was colder and Dan said there is a 10 degree difference between the top of the hill and bottom of the hill. The hill isn’t that high so it was interesting how much of a difference there could be. We then saw an example of what the vineyard looked like when the McLaughlins started working it, and it is day and night between what they currently have. They still plan on getting to the last section of vineyard which is Merlot and clearing that out. I had been wanting to see the vineyard since the first time I met Dan McLaughlin. 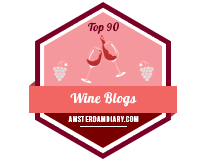 They have definitely done a lot of hard work in the vineyard and it is showing, along with the experience Dan has accumulated along the way. We thanked Dan and Jeanie for their time, said our goodbyes, and it was time for the long trek back home which ended another wine fun filled weekend. 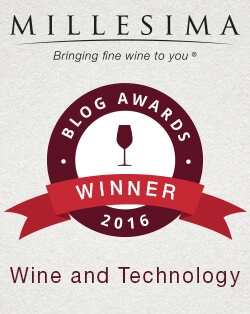 Sounds like your wine cooler may be bursting at the seams!! We’re giving it a good filling, that’s for sure! Excellent article. Everything is spot on!